As the azaleas in my yard attest, spring came a little early this year. There are still beautiful flowers and trees in abundance around town (as my allergies faithfully remind me), but the brief annual burst of azaleas was just slightly ahead of the festivities that are carefully planned to celebrate them. Some varieties of azaleas have blooms that are still quite spectacular, but with the exception of one lone bush in my yard, my azaleas have resumed their evergreen appearance for the next 11 months, give or take a month. 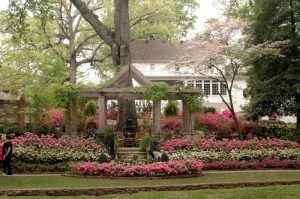 Timing the azaleas is a difficult task, but planning a gift to a local charity doesn’t have to be. Here is a great piece of advice for those philanthropists in our area who like to be first: East Texas Giving Day is April 25 this year, but our new technology platform has a great feature that allows donors to begin making prescheduled gifts on April 10, just over a week away for those of you reading the print edition of this column, and less than two weeks away for those early birds reading the electronic version. If you plan to be out of the country on April 25, or otherwise inaccessible via social media, you can go online to EastTexasGivingDay.org and begin making gifts as early as April 10. In fact, you are encouraged to look up your favorite charities, preschedule your gifts and begin sharing the news via your social network. Gifts that are prescheduled will appear on the EastTexasGivingDay.org leaderboard when the event begins at 6 a.m. on April 25. It’s no secret that Giving Day experienced a technology problem early in the day during our event in 2016, but this new prescheduled giving feature, provided by a new technology partner, can take some of the pressure off the event, especially for those of us in the nonprofit sector who are working hard to encourage contributions to nearly 175 charities who will participate this year. The website is live for 2017 with an active countdown clock and information about each of the participating charities. On April 10, a donation button will appear, and prescheduled giving can begin. This is a call to philanthropic nirvana for those of you who are finished with your Christmas shopping before school starts each fall, and for those of you who were up at midnight on May 2, this past year for the start of our first East Texas Giving Day. If you are eager to show your support for your favorite charities during East Texas Giving Day 2017, you don’t have much longer to wait. This year’s participating charities are based in 23 East Texas counties, with 130 of them located on the Texas Highway 31 corridor stretching from Athens through Tyler to Longview. Participants also stretch as far as Bowie, Lamar, Freestone and Angelina counties. I hope you will take the time to learn more about the great work of our East Texas charities and support them in their online fundraising efforts. I look forward to celebrating giving with you on East Texas Giving Day, and encourage you to get online soon to find the charities you want to support and preschedule a gift. In my next column, on April 23, I’ll have a preview of how prescheduled gifts are adding up. Perhaps going online April 10 to EastTexasGivingDay.org is your next opportunity to get a jump on giving well.